You may not have noticed, but for the past few days I’ve actually been working. Like, for money. I’ve been full-time mommying for exactly nine months (happy birthday, dashy!) and have finally figured out how to juggle that along with some freelance. I know, I’m really really slow to catch on. One thing I totally figured out, though? Mommying doesn’t pay well. So work on my desk means that I really need to not be blogging right now. I need to get to work on this book (which incidentally, is quite interesting. i typically work with fiction, but this one is all about how to raise a better family, go against the mainstream, be a better person, etc.). My friend Cassie made this and it’s been getting some good press (Here and Here). 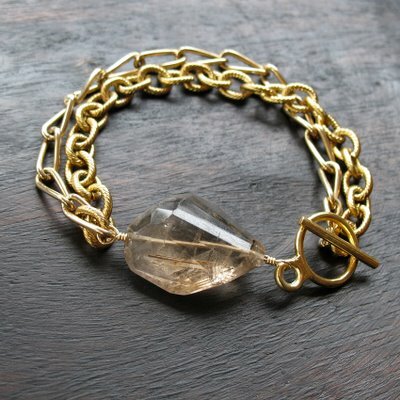 The Golden Opulence bracelet is a limited edition run featuring vintage brass chains and a single nugget of Copper Rutile. Each bracelet will be unique since no two Rutile gems are ever the same. Get yours now, but leave one for me ok? People, the beauty that is a rummage sale happened to me this weekend—twice over. Though “beauty” might not be the right word since it was still me and dozens of other bargain hunters jammed into a church basement looking at boxes of old stuff that may or may not have contained used electric razors and calendars from 1993. But Robyn and I went there to win, so we elbowed our way toward the good stuff. By the way, a great time to have a baby on your person is when you need to get ahead in a crowd. No one is going to shove the lady with a baby in the Bjorn. Borrow one if you have to. I didn’t have the patience for the boxes upon boxes of fabric, or maybe it was that Dash in the Bjorn made it difficult to bend over and rummage. I left that to Robyn and she came away with the coolest black and white fabric with a cops and robbers motif. I headed to housewares to score three pyrex dishes in three patterns (gold acorn, spring blossom 1, town and country). Also, I may have brought home some Holly Hobby Colorforms for no reason whatsoever. Total expense: Two dollars for a bag full of retro fun for my house (not for the shop this time!). And if you should happen to see a documentary on “Hot Young Moms at Rummage Sales” could you let me know? I think I might be the unwitting star. I saw a few men with cameras while I was there but there were so many other people and I was so determined to find cool things before they did that I blocked them out completely. Robyn told me after that they were following me around somewhat obsessively and she overheard them telling someone they were filming a documentary. I know I was a bit crazed with bargain hunting but I think I’d remember signing a release. Just sayin’. Rummage Sale Number 2 (Electric Boogaloo) was just like the first one except that there were no people, no stuff to rummage, and no one shooting priceless footage of “Hot Young Rummaging Moms: Watch Out For Your Pyrex!” Sadly, we missed out on day one of the sale and so, likely missed out on the goods. Overheard while we were shopping: “This is just what’s leftover.” But I did score a great old album called “folk western” for Dash. Songs like Rock Candy Mountain, Dixie, Lone Prairie, etc. Supercute illustration on the cover drew me in. He’s my little cowboy. Sunday I made a giant list (as I’m wont to do) of things to get done during the day and then promptly ignored it and decided to head to Bradbury Mountain State Park for a short hike with the family. Apparently, everyone else in Maine had the same idea because they were all there with their walking sticks and seven children under 10. But it was beautiful and warm (in the 70s) and we managed to take a really good family photo. Finally! Hope your weekends were splendid. Just one more week of our CSA veggies to go but I already have a pantry full of tomatoes, parsnips, carrots, beets, onion, garlic, and squash. It’s hard to keep up, I tell ya. We share a share, and still the sheer amount of veggies is a bit overwelming, especially with a baby on hand. He doesn’t seem to care that I’m charged with feeding the family in addition to playing with him. Pounds of tomatoes to deal with? Hello, I want to play peek-a-boo again. Maybe it’s that I’m a sucker for peek-a-boo, but I’ve let a few weeks of veggies pile up and am feeling the pressure to use it or lose it. That’s right. I’m gettin’ all tough on the veggies now. I’m bad. So the plan? This weekend I’ll be making a double batch of chicken soup (carrots, onions, parsnips) to freeze for colder days, and then salsa (tomatoes, onions, garlic) to be canned and put in the basement, and then ultimately I might just blanch and freeze whatever is leftover that we won’t be able to eat in time. That’s right, parsnips. I’m talking to you. And of course, whatever can be pureed for Dash will be pureed for Dash. I wonder if he’ll be sick of squash by December. While we’re talking about food, let’s talk dinner. It’s only 11:36 and I’ve already planned what we’re having. You have to, you know. If I don’t, we end up with take out and that’s not always budget friendly. It’s tasty, but not budget friendly. Place flour in a shallow bowl. Season chicken with s & p; dredge in flour, shaking off excess. In a heavy pot or dutch oven, heat oil over medium-high. Add chicken, and cook until browned, 4 to 6 minutes per side; transfer to a plate. If using rice in place of couscous, make it now. Add onion, ginger, and cinnamon to pot. Cook, stirring occasionally, until onion starts to soften, 2 to 3 minutes. Return chicken to pot. Add broth and sweet potatoes (or chick peas). Bring to a boil; reduce heat, and simmer until chicken is cooked through and sweet potatoes are tender, 10 to 15 minutes. Discard ginger and cinnamon, stir in lemon juice, and season stew with salt and pepper. While stew is simmering, prepare couscous. Serve stew over couscous and enjoy, preferably on a cool, windy, even rainy, day. You are currently browsing the HappyDash weblog archives for October, 2007.